The last TGA issue (Vol III, No 1) covered several research areas. The next issue appears to have even more. This post stops and looks at progress so far. 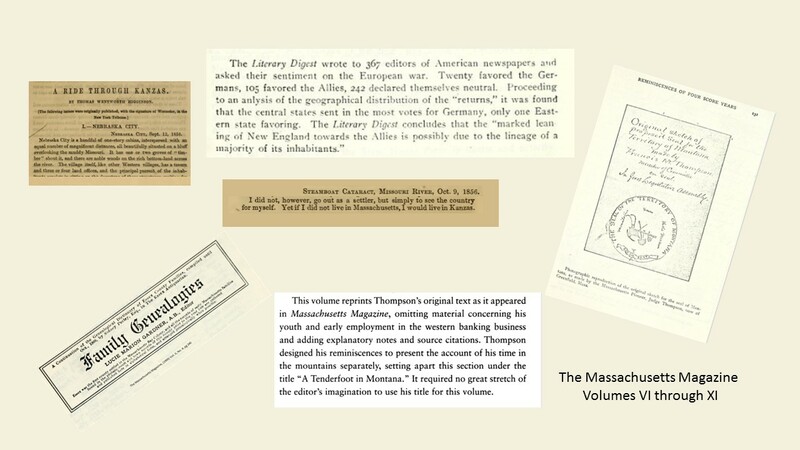 Last time, we looked at Volumes I through V (reprint of article, link to digitized version) of The Massachusetts Magazine. That was really a cursory first look. While going through Volumes VI through XI, we took time to dive into all of the issues. So, we will provide a look at the Table of Contents, again. However, we will start to report on the dive. The next few bullets summarize some of the findings. Turns out that the co-editors of Dr. Frank were elderly. This time we got to look at Civil War veterans, including their activity prior to the onset of the major conflict. One example is Col. Thomas W. Higginson who was part of the Secret Six and who helped the western cause related to anti-slavery. The Colonel sent dispatches back to an eastern newspaper; hence, we have this personal view to digest. Then, we have Judge Francis M. Thompson who west as a young man following the path of Lewis & Clark. He wrote of his experiences. The State of Montana, recently, published part of this. The Judge returned to New England where he died. Franklin B. Sanborn left us several views of the times. These three are only part of the writers that Dr. Frank collected to support his magazine. Sidney Perley, the noted author, retired about the time that the TMM got started. Dr. Frank's sister, Lucie M, picked up his work and published in several issues. As well, she reported on the activities of lineage groups, including The Old Planters Society which used the TMM as its voice. Other areas that will get further study deal with early times. 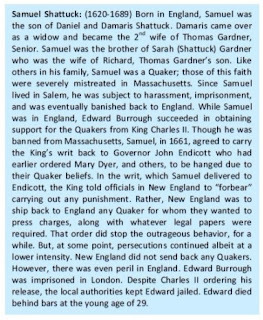 For one, information about Samuel Shattuck bears another look. He was the son of Thomas' last wife. As well, Nathaniel Easton is in Dr. Frank's line. We have additional information related to research on him and the events that seem to be one-side-ly celebrated each year. 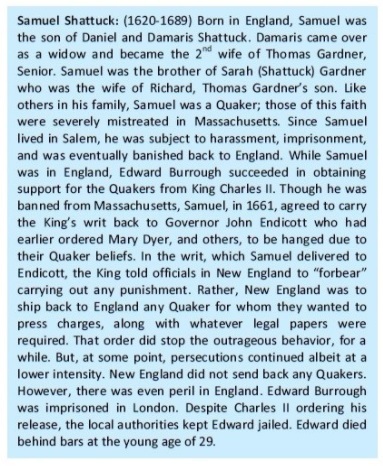 An article written under the auspices of Gardner Research was cited in The American Genealogist. As a reminder, The Atlantic (Monthly) started in Boston in 1857. It moved to DC recently. There have always been new magazines starting. The TMM was only one of several periodicals that started and had its day. 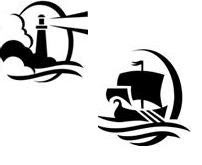 Going back to the 1800s, we can look at two that related to our work. The Southern Literary Messenger had an illustrious set of editors, starting with Poe (of the Raven). Its run was from 1834 to 1864. We are interested in that it involves collateral families, is of VA, and had contributors from all over. One article on the Lyceum movement is an example. It was nation wide. New England played a heavy role. But, we see groups formed out in the western areas (which became states), too. Then, we have a story that is New England to its core. Namely, learning about Count Rumford. Born in New England, he left due to being a Loyalist. Now, he did pioneering in thermodynamics. Actually, as a polymath, he worked in several areas. Did well. Got rich. Then, left monies to Harvard. After the first holder (Bigelow) of the Chair resigned, there was much discussion about the future use of the monies. So, we can look at this from several angles. An interesting twist is that Charles W. Eliot was supposed to get the Chair and did not. He went to Europe. Later, he was head of Harvard. And, made lasting changes. This post continues to look at the periodical that Dr. Frank published, from 1908 to 1918, with his friends and deals with Count Rumford and Charles Crozat Converse. First, who is Charles? My question, exactly. Well, in Vol. VII, No. 1 of the Massachusetts Magazine, Charles wrote an article titled "Thompson in Connecticut" which is about an American who became Count Rumford. There is a seat at Harvard by that name. More on that, below. Back to Charles, first. Godey's Magazine, Vol. 134 (pg 80) had a nice article about Charles. He was a lawyer and a musician with several known hymns. Also, he is written up on Wikipedia. And, some of his ancestry is covered in J. J. Putnam's book on Joseph Convers of Bedford. Also, see C. B. Harvey's Genealogical History of Hudson and Bergen Counties, New Jersey (pg 459) for a brief bio. In his TMM article, Charles mentions his family's effort to place a statue of Count Rumford in Boston (it is now in Moburn). As an aside, Godey published the The Lady's Book from 1830 to 1878. That is a long run. The article on Charles (see above) is quite good. Now, to Count Rumford. He was born Benjamin Thompson in 1753 in Woburn, MA. Being a Loyalist, he ended up in Europe and had quite good success. Benjamin was an early thermodynamics researcher: Rumford’s calorific and frigorific radiation. Also, he has wide influence. For the Rumford Medal that is given by the Royal Society, we see a whole lot of illustrious names. For instance, Michael Faraday received the award in 1846. Benjamin, also, left funds to Harvard for the Rumford chair that was first held by Jacob Bigelow. When Jacob resigned, Benjamin Peirce (father of Charles Sanders Peirce - more on this later due to some interesting connections) got involved as a replacement was considered. Eventually, Benjamin Peirce got the Rumford chair rolled into the new ‘practical’ school (Science at Harvard University) related to science and engineering (that is, getting away from counting angels on a pin head). There is a lot to know about Benjamin Thompson (The Life and Legend of Count Rumford). Commercial site with links to information about Count Rumford. 08/03/2017 -- Turns out that Benjamin's money gives us a chance to look at Harvard, its history, it roles, and its dreams (hopefully, more than exultation on endowment size). The platform? Quora: What is the coolest obscure history fact you know? Another side of the story, Charles W. Eliot was supposed to get the Rumford chair in 1863. It went to Oliver Wolcott Gibbs. 10/21/2018 -- Used Benjamin in the context of meritocracy or not: Does Affirmative Action hurt Asians?